Throughout time, many of the prophets were able to heal people of their illnesses. But what was the purpose in the ability to heal the sick? Was this a way of telling people that they represented God? Or did these prophets understand the causes of these illnesses? Understanding the soul/heart is important in the removal of an illness. It helps you understand how causality and karma work. Oyasama (comparable to Jesus in the Christian Church) once said that sometimes we must not pursue to challenge people who we believe have wronged us. She emphasized that their anger and vice (dust) may attach upon us, and cause us to act like them. This is certainly obvious in our political environment where both parties are stretching the truth and fabricating lies and innuendos in going after people they believe are immoral or corrupt. How do we seek justice for the crimes that we believe have occurred? Do we have a responsibility to stop and report it? Maybe. Is our justice system always right? Of course not; we know that some guilty people are exonerated, and some innocent people are incarcerated. Is there a universal justice, where all are actions are monitored, and justice rendered as joy or suffering. Like the classic Christmas song, Santa Claus is Coming to Town, where Santa is making a list, and checking it twice; finding out who is naughty or nice. Is God Santa Claus who makes sure that justice is delivered to everyone equally? Or could we have something within us that is monitoring our behavior and thoughts, and eventually meting out justice. Some will call this the soul, heart, or spirit, which continues for eternity, unlike our physical bodies that decay. It is the soul that collects are merits and demerits, and eventually delivers joy or suffering back to us. Most of us unfortunately do not see immediate justice by the soul. This is why evil people believe that they can get away with their crime as long as no one sees it, or escapes quickly from the scene. From the perspective of the soul, these people are dead wrong; justice will prevail. We see good and evil in this world and we see joy and suffering in the world, but the lapse of time often obscures the cause and effect relationship. Just because one does not see flashing red lights or iron bars does not mean that justice has been avoided; time will eventually catch up with the evil person because of the soul. How many celebrities would give up their fame and riches to attain this true joy? How many drug addicts would give up their dependence if they could have this complete joy. How many bloggers, face book and twitter member would give up all their likes and followers to attain this? How many politicians would give up their position to receive this? How many lucrative businesspersons would give up their positions in their organizations to receive complete joy? One may believe that all these people would come running to have the opportunity to attain complete joy in their lives. But this would mean that they would have to abandon some of their preconceived ideas on what will bring upon happiness. Money, drugs, fame, and power do not bring upon happiness. They do not guarantee against sufferings and obstacles in our lives. There is no insurance we can buy to prevents these negative occurrences. Having money, fame and power by itself is not evil or wrong; and attained and used in appropriate ways may help bring upon happiness. So what are the conditions God requires for us to attain complete joy? Let us list conditions that God does not require us to have. It does not require us to have any type of profession or job. It does not matter if we are rich or poor. It does involve medication or drugs to make us happy. It does not matter what others think about our accomplishments or us. The solution to find complete joy is within reach of all of us. It does not require us to research ancient sacred books, pilgrimage to holy sites, or seek gurus and sages. The solution is in our minds. God tells us that we must remove greed, arrogance, miserliness, covetousness, and self-love from our minds. When our mind becomes pure of these evils, God promises us complete joy for eternity. What makes complete joy possible by eliminating evil thoughts from our minds? Enter the pure soul or heart, which functions to distribute only joy when our minds are void of evil thoughts. When are minds are contaminated by evil thoughts, the soul also becomes immersed in negative energy. These negative energy around the soul is eventually eliminated by conversion to suffering and inconveniences. To attain complete joy is a simple solution in theory, but very difficult to actualize in our daily lives. Many of us have these evil thoughts in our minds that influence us to act when temptations or obstacles appear in our lives. But religions tell us that these evil thoughts are sins when acted upon, and that we have free will to act or not act upon our thoughts. It is our resistance to these evil thoughts by not acting upon them that will eventually purify our minds of these thoughts. By this process our souls become pure, and only bring upon complete joy in our lives. In summary, it is not what is attached or associated to us that brings upon joy or suffering, but it is what is contained in our minds that bring upon joy or suffering. It is this information that the soul collects, carries and distribute from one life time to another. In is human nature to blame others when events in our lives do not go as planned. It is not surprising that we seek religions that place blame on others for our problems. For example, many religions have an evil force like Satan or the devil that opposes our happiness. Other religions blame nonbelievers for the problems in the world, and attempt to convert them by fear, coercion or death. Even in our large congregations, pastors tell us we suffer because we don’t believe in God like they do. They tell us “All you have to do is believe”; but what about reflecting on our affairs, our greed, our hate, our ignorance, and our arrogance. Heaven forbid that we should reflect on our behaviors; but it is easier to blame others and believe in a powerful God that forgives us if we obey. It is not surprising that religions that promise the easy path to heaven or an afterlife will flourish. People do not want to accept that maybe they are at fault for their sufferings. It is easier to accept doctrines from so-called authorities from God, promising them eternal joy upon their compliance. It is from this perspective of blame that we need to find the source of our sufferings. Is it Satan, or is it other people that cause our sufferings? To place blame on these two solutions would be easy, and has been documented in world history. The result has been more suffering in the world. Where does joy come from? It is said that happiness comes from within us. Some people refer to this source as the soul, spirit or heart. It is this soul that was once pure and brought upon only joy to the individual. But ever since the first sin, our souls have been contaminated by our evil minds, resulting in an impure soul. It is our impure soul that brings upon our sufferings in life. Our angry co-worker, our accidents, and our obstacles are messengers of our souls. How do we make our souls pure again so we can experience only joy in this world? We must remove our evil thoughts like greed, arrogance, miserliness, covetousness, and self-love from our minds when our soul brings upon inconveniences. It will not be easy removing these evil thoughts in our minds since they are often ingrained in our minds like dust on a mirror. If we calm our minds and do not act upon our evil thoughts when suffering occurs in our lives, we can gradually remove these evil thoughts from our minds, and eventually purify our souls again. This will eventually bring only joy to our lives. Suffering delivered by the soul is something most of us fear, but it becomes useful in removing evil thoughts from our minds if we understand the function of our souls. Yet many of us believe that suffering comes from outside of us, and direct our efforts at the messengers of our souls. This eventually causes more sufferings. We must look within ourselves first. Please visit heaventruth.com for more information on the Soul. When we act on our negative thoughts (? ), we cause suffering to others, and create negative energies (-( or demerits that convert to more negative thoughts and also demerits which the soul collects and stores. What makes our religion so special is that God gives us a prayer to save the world. In the Ofudesaki, our sacred book, God gives us the instructions to utilize this special prayer (key). Without these ingredients our prayer (key) will not reach God. These are the following instructions to open our prayers to God. Purify our minds of greed, arrogance, self-love, covetousness, and miserliness. Spread God’s truth of the Soul/heart and that God will begin to save us (hinokishin). Pray with our special prayer, the Joyous Service toward the Kanrodai. The Kanrodai is the location where human beings were started. We believe that Oyasama was the first parent and that her soul resides at this location. 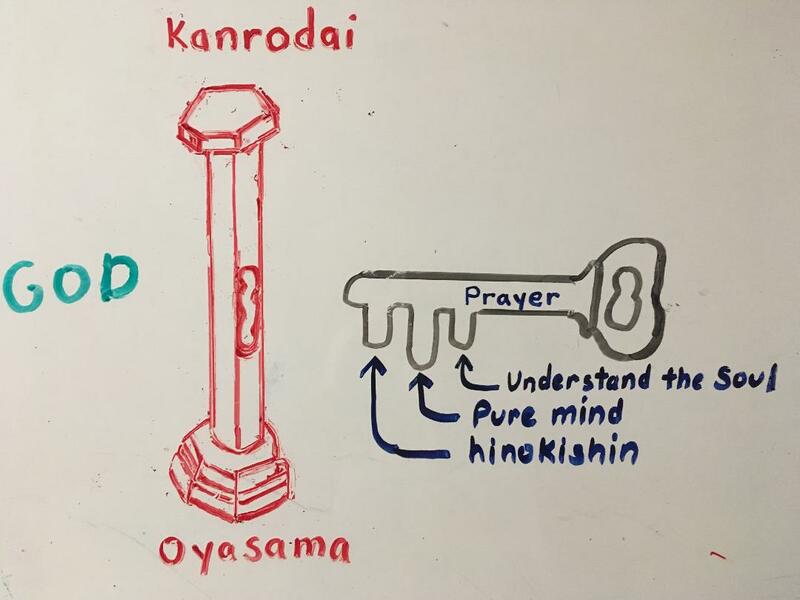 Some believe that this is where God compares our mind with the pure mind of Oyasama when we pray to God. The definition of hinokishin explained here is different from the traditional translation of volunteering. Hinokishin means spreading God’s truth by telling people about the soul/heart and that God will begin to help people understand the soul/heart. In summary, all the condition are required for God to answer our prayer for world salvation. Until you settle your own minds. Must ponder over it deeply (to spread God’s truths).